Lot Size: 22,OOO sq. ft. Right at the Atlantic Ocean, just around the corner from the Stella Maris Resort Club. In the heart of Stella Maris Village – yet tucked away, almost completely out of sight. Ca. 1,6OO sq. ft., plus balconies. Large living room, with open kitchen, 2 large bedrooms, each with large bathroom. Rainwater collection tank; separate one-vehicle garage; gazebo. Concrete Framed, Cement Blocks, Lumber Roof – Asphalt Shingled. Exterior/Interior Wall Finishes: Cement Plaster, Latex and Acrylic Latex painted. Furnished, bedrooms have wall A/C units. Very good overall condition in/out. 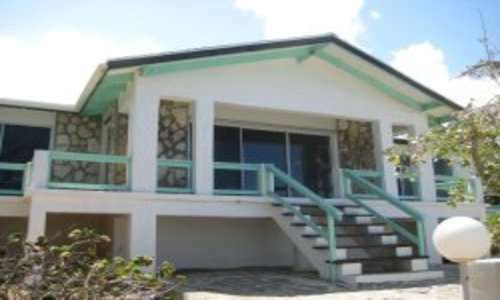 This bungalow sits in an ideal location for Resort Club Vacation Rentals, which it has been operated under over the years of the present ownership. Can be continued or discontinued. All Legal Fees and Government Stamp Taxes are to be evenly carried, by the Vendor and Purchaser, additionally.